Here you can download our manual & troubleshooting guide as PDF. 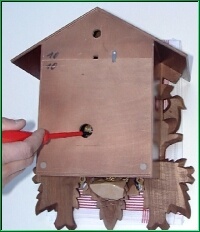 This list is a collection of frequently asked questions about the functioning of cuckoo clocks. We listed the possible malfunctioning alphabetically, indicating what to do to make the clock run again. If none of these remedies help, please send an email to a.herruhren@t-online.de or a fax to +49 (7833) 7724. The pendulum moves to slowly. To correct that, take off the pendulum, slightly move up the wooden leaf/shield, and hang the pendulum back on. Then push the pendulum to the side to make it run. If the clock still loses time, repeat the aforementioned. If the clock keeps losing time even though you have moved up the leaf/shield, then the leaf/shield is not properly fixed to the pendulum stick. Take off the pendulum, put it face down on a thick newspaper or cloth, take a small hammer, and carefully hit on the black metal holders that they tighter hold the pendulum stick. Caution!You may hit your fingers with the hammer which may cause injuries. Hang the pendulum back on and push it to the side to make it run. The pendulum moves too fast. To correct that, take off the pendulum, slightly move up the leaf/shield, put the pendulum back on, and make the clock run. If the clock still gains time, repeat the aforementioned. 1. You may have forgotten to remove the clamps that secure the bellows during transportation. Pull up the weights completely. 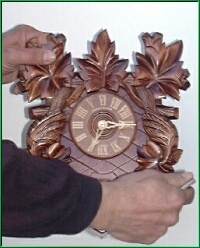 Take off weights, pendulum, and top carved piece (only traditional carved cuckoo clocks). Put a newspaper or cloth on a table, put the clock face down on the newspaper/cloth, push up the small bolt that sets free the back lid, take a screwdriver and put it in the hole on the top end of the back lid (next to the bolt), and pull open the lid. Then, pull out the clamps that stick around the bellows. 8-day clocks with music only have one clamp. 2. You may have forgotten to unbar the cuckoo door. Push up the bolt that blocks the cuckoo door. 3. The night-off handle may not be in the correct position. The clock has a manual night-off handle. It is either underneath the cuckoo clock cabinet (shaped like a ring) next to the hook of the left weight or at the left wall (shaped like a bar). If you move this up ( push it), you can turn the cuckoo off. If you move it down (pull it), the cuckoo calls on the half hour and on the hour. Try the clock by moving the minute (long) hand to the next half/full hour and see whether the cuckoo calls. If that does not help immediately, try to move the bar several times up and down (in and out), and move the minute hand on the next half/full hour.If the cuckoo still does not call, gently pull the right weight (it is the weight for the cuckoo) a little bit and try again by moving the minute hand (long hand) on the half/full hour. 4.If none of the above help, please follow the next steps:Wind clock up by pulling up all weights. Take off weights, pendulum and top part. Take clock from the wall and gently shake it in different positions, also upside down. Make sure to hold the clock at the bottom panel and at the roof, otherwise you might either break the carvings/figurines or the clock might fall out of your hands. Hang the clock back on the wall and put all parts back on. Move minute hand (long hand) to the next half/full hour and check if the cuckoo now calls. 1. Try if you can easily close the door by hand. If so, the clock does not hang in the right angle on the wall. Make sure that the clock´s back wall is parallel to the wall where it hangs, i.e. in a right angle to the earth surface. To smoothe the working of the door put a little oil on the door´s hinges. 2. 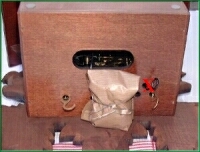 If you cannot easily close the door by hand, completely pull up the weights, take off the weights and pendulum, open the back lid (see “cuckoo clock manual” #2a) and check in the open back if the wire that is marked with a red 1 is underneath the cuckoo´s tail. If not, please move it underneath the tail. Close the back lid, hang the clock back on the wall, and put all parts back on. 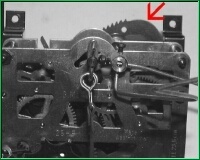 The chain jumped off the turning gear inside the clock. Putting the chain back on track is a slightly complicated but manageable operation. a) Rewind the chains until the weights are fully pulled up. b) Take off everything that can fall off, i.e. all weights, pendulum, and carved top. 1. Take ring and hook off the chain. 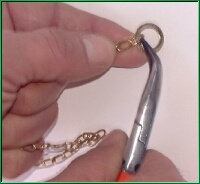 c) Remove the brass ring from the chain by opening the end of the chain with pliers. d) Pull the chain from the side of the hook until it has come completely out of the clock. e) Take the clock from the wall and open the back lid. Inside you see two wheels on the bottom of the clockwork. The chain on the black wheel is now missing. You see one wheel from the front, one from the back. The chain has to go on the black plastic wheel. It is double sided. Inside are hooks to hold the chain which you cannot see. The black plastic wheel is not connected to the brass gear wheel. You can move the left plastic wheel in the direction of time, the right plastic wheel against time with a screwdriver. It makes a clicking sound when you do that. It is the same sound as if you pulled the chain to wind the clock. 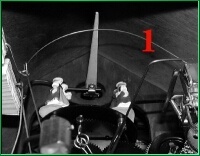 f) Turn the clock upside down and let the end of the chain fall between one and two inches through the outer hole. Make it go in right behind the gear wheel that you see. Carefully turn the clock back (direction against the hands of time when working on the left wheel, with the hands of time when working on the right wheel) that the end of the chain slings around the black plastic wheel and that the chain links get in the hooks. This is the most difficult part, as the chain might fall off. You might not want to turn the clock back in a completely upright position but stop turning it still slightly bent. g) Take a thin screwdriver, put it in through the hole on the bottom where the end of the chain is supposed to finally come out. Put the tip of the screwdriver in the black plastic wheel (remember it is double sided and has the hooks inside). Move the black left wheel to the left (the right wheel to the right) with the screwdriver until the chain comes down between the two wheels. Make the end of the chain go through the second hole. When it is through the hole, you can pull it by hand. If the black wheel turns when you pull the chain and if it makes the same sound as if you pulled up a weight, then you got it right. Pull up the chain until the hook at the other end of the chain is completely up. h) Close the back lid and hang the clock back on the wall.i) Put back the brass ring at the end of the chain. If you don´t put it back on, the chain will fall off once the weight is all down.j) Put back weights, pendulum, and carved top. Set the right time and everything should be fine. 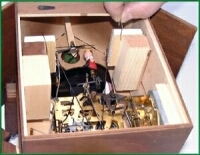 What could have happened is that the wire holding the propeller of the music box was bent accidentally. 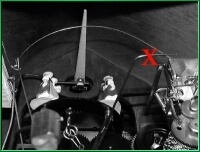 You must be two people to fix that.a) Wind up clock by pulling up all weights.b) One person lifts clock carefully from the wall, weights and pendulum still attached.c) The other person opens the back lid of the clock and slightly bends up the black wire which is marked with a red X on the picture.d) The front person moves the minute hand (long hand) to next full hour while the back person checks if the music movement starts working after the cuckoo s call.e) If the music box starts playing before or during the cuckoo s call, you bent the wire too far up. Bend it down a little and try the clock again (see d).f) When the music starts after the cuckoo stopped calling, hang the clock back on the wall. Check if the cuckoo calls at the same time distance to the half and the full hour. If so, the minute hand must haveTo solve that problem, slowly move the minute hand forwards. As soon as you hear the clock beginning to chime, immediately stop moving the hand. 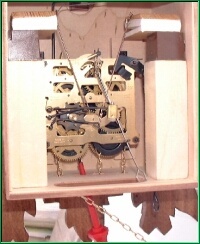 Then loosen the bolt/screw that fixes the hands to the clock´s face until you can move the minute hand freely without moving the clockwork. Put the minute hand on the time determined by the chime you just heard and tighten the bolt fixing the hands to the clockwork. Now, the clock should work correctly. been moved incorrectly. If at the full hour the cuckoo does not call the hour (it calls more or less often than the hour indicates), slowly move the minute hand forwards. As soon as you hear the clock beginning to chime, immediately stop moving the hand, and count how many times the cuckoo calls. Now, it is the only time that you may movethe hour hand. Carefully put the hour hand on the hour determined by the cuckoo´s call. Now, the clock should work correctly. 1. Make sure that all the weights are pulled up. If a weight does not stay pulled up, see Chain does not stay pulled up. 2. Check that nothing interferes with the pendulum. If the clock hangs in a room where it is exposed to a strong current or breeze, either block the current or hang the clock in a different room where there is no wind. 3. Check that the clock hangs straight by listening to the ticking sound. Push the pendulum until you hear the clock ticking. If you do not hear an even tic-tac to both sides, slightly tilt the clock to the side until the tic-tac is even and regular. You enhance your hearing skills by putting a wooden stick to the bolt that holds the hands and to your ear. 1. Make sure that you removed the transportation paper. Put clock face down on a thick newspaper or cloth. Push up the small bolt that sets free the back lid, take a screwdriver and put it in the hole on the top end of the back lid (next to the bolt), and pull open the lid.Pull the paper from the chime wire. Close the lid, hang the clock back on the wall, and put on all the parts. 2. Check if the chime touches the back wall. Open the back lid (see #1 above). Put the back lid on a table in an upright position. If the chime wire touches the back wall, take the wire and slightly pull it opposite from the wall until it slightly bends and does not touch the wall anymore. Close the back lid, hang the clock back on the wall, and put back the removed parts. 3. If the chime still makes a rattling sound, pull the chains completely up. Take off weights, pendulum and top part (only traditional carved cuckoo clocks). Take the clock from the wall. Put clock face down on a thick newspaper or cloth.On the lower side of the back lid you see a round hole. 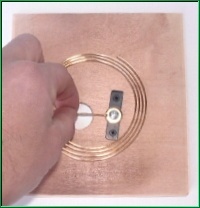 Behind the hole you see part of the gold plaited chime wire. Take a screwdriver, put it in the hole and slightly bend down the chime wire. Put the clock back on the wall and put back removed parts. Pull the chains completely up. Take off weights, pendulum and top part (only traditional carved cuckoo clocks). Take the clock from the wall. 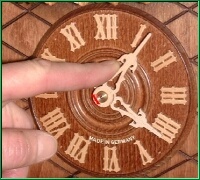 Put clock face down on a thick newspaper or cloth.On the lower side of the back lid you see a round hole. Behind the hole you see part of the gold plaited chime wire. Take a screwdriver, put it in the hole and slightly bend up the chime wire. Put the clock back on the wall and put back removed parts. You must be two people to fix that.a) Wind up clock by pulling up all weights.b) One person lifts clock carefully from the wall, weights and pendulum still attached.c) The other person opens the back lid of the clock and slightly bends the golden bar X to the left or to the right so that it fall into that hole (marked with a dart) to stop the music. d) The front person moves the minute hand (long hand) to next full hour while the back person checks if the music movement stops after one song and then hang the clock back on the wall. Pull up the weights completely. 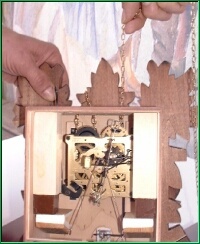 Take off weights, pendulum, and top carved piece (only traditional carved cuckoo clocks). Put a newspaper or cloth on a table, put the clock face down on the newspaper/cloth, push up the small bolt that sets free the back lid, take a screwdriver and put it in the hole on the top end of the back lid (next to the bolt), and pull open the lid. Take a screwdriver and push the black metal, called rak(marked with a red dart) down. Close back lid, hang clock back on the wall and put all parts back on.